The Commercial blender from vitamix can be purchased at a very affordable price. Its durable & comes with a one year warranty. 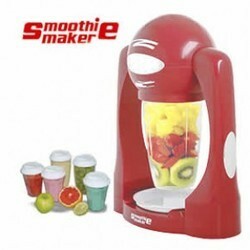 It can crush ice into the drinks, so you can make Smooties, Cold Coffees, Milkskakes, Thick shakes etc. - Product Dimensions: 15.25" x 5" x 5"
Smoothie Maker is a complete blending and food preparation machine makes preparing food you enjoy much easier! Pro V Smoothie Maker is the easiest, fastest and safest way to make delicious, yet simple recipes for salsas, dressings, soups, sauces, batters and more. It's quick to assemble, easy to clean and convenient to store. Makes Fresh Juice in 1 min...Smoothie Maker is an absolute blending and food preparation machine Its fast to collect, easy to clean and convenient to store. 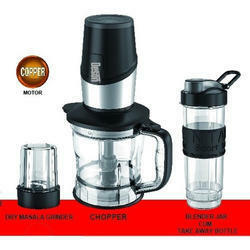 Ideal for making smoothies, juice and sorbet. Only takes 10 seconds to make a delicious drink. Ball bearings and the protection system avoid overheating and current overflow. Power supply: 100 to 120/220 to 240V AC, 50/60Hz and 300W. Safe and easy to operate. Combination knife system with turbo function & Safety button.